ZJ40 truck mounted drilling rig is the biggest light duty self-propelled truck-mounted drilling equipment. Several patent technologies and new technologies are used in the unit. Mature and reliable compound system for double engine is used. Compound gear box with unique design is of reliable driving performance and reasonable load distribution. Auxiliary brake of draw work is air control water cooling disc brake. 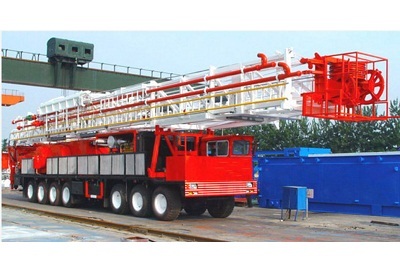 128' (39m) mast and chassis frame is fabricated with special material and structure to ensure reliable strength and to reduce weight efficiently,and it provides great performance to satisfy the requirements for 13,120' (4000m) drilling operation, meanwhile, it also ensures the traveling efficiency and performance.